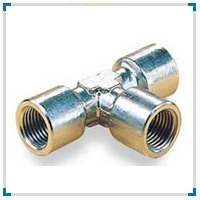 Tube couplings are the most suited fittings for handling of toxic and hazardous fluids or gases. Widely supplied to industries of oil & gas, power generation and petroleum for use in piping systems, these couplings have the endurance for vibrational loads and flexural stress. According to the material used in the piping work and the nature of the fluid or gas carried in it, we manufacture these tube couplings in different construction metals and grades.